Walk in Tubs that offer advanced safety features can be a great choice for homeowners in the Des Moines, Iowa, area. If you have a difficult time stepping up high to get into and out of bathtubs or can’t stand for long periods of time, you may want to consider walk in bathtubs that include low thresholds and wide doors. In addition to safety features, some walk in tubs also offer water therapy jet systems and even heated seats. These spa-like features do not only aid in relaxation, they can also soothe symptoms from common ailments like back pain, arthritis, stress, anxiety, sciatica, congestion, shingles, and more. For top-of-the-line walk in bathtubs in the Des Moines, Iowa, area, trust the specialists at U.S. Patio Systems and Home Remodeling. We sell and install bathtubs that come with exceptional safety features and spa-like elements to ensure you have a safe and relaxing experience every time you bathe. 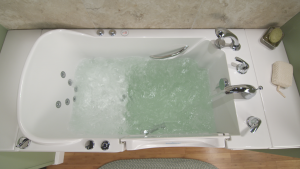 Some of the safety features our walk in bathtubs come with include anti-scald technology, anti-slip floors and seats, easy-to-reach controls, quick drain capabilities, built-in grab bars, and so much more. Plus, our walk in bathtubs are manufactured to perfectly fit in traditional tub spaces, so we can easily install a walk in tub in your home with minimal, if any, demolition work. To learn more about the walk in tubs we offer to homeowners in the Des Moines, Iowa, area, contact U.S. Patio Systems and Home Remodeling today. Our experts are available to answer any questions you have.